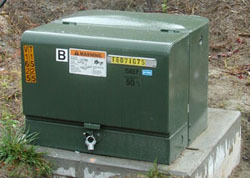 A padmount transformer is a ground-mounted utility distribution transformer, which usually is housed in a locked metal cabinet, situated on a small concrete pad. These distribution transformers are normally located in residential subdivisions. Since all of the live contact points are enclosed in a grounded metal box, this kind of transformer can be situated in residential locations and do not need to be fenced, like transformers in utility substations. Padmounted transformers are connected to underground utility distribution lines at what is called a "service drop", in order to step down the primary voltage on the utility distribution line to the lower secondary voltage which is then supplied to a utility customer. Many padmounted transformers may serve a single large building, or it may serve many residences. They are usually manufactured in power ratings from around 75 to around 5000 kVa and often includes built-in fuses and switches. A typical enclosure includes a tank for holding the core/coil assembly of the padmounted transformer immersed in oil or the like, and a wiring cabinet having high and low voltage wiring compartments for enclosing the high and low voltage bushings, respectively, of the transformer, etc. In order to prevent unauthorized access to the core/coil assembly of the device held within the tank of the enclosure, the most common prior art practice is to weld a cover over the top of the tank. Other prior art tank covers are secured with carriage bolt-nut assemblies, and include some means for shield the nuts, etc. Such shielding means result in a cover that protrudes past the top of the tank cover by several inches and causes water, etc., to be trapped along the edge of the cover. The wiring cabinet of a typical padmounted transformer enclosure includes left and right sidewalls, and left and right lockable doors that swing open, exposing the high and low voltage wiring compartment. One of the doors swings out to the right and the other door swings out to the left, leaving the front completely open, but the right and left sidewalls remain fixed in place. It is recommended that padmounted transformers be located in accordance with certain guidelines with respect to exterior building walls. 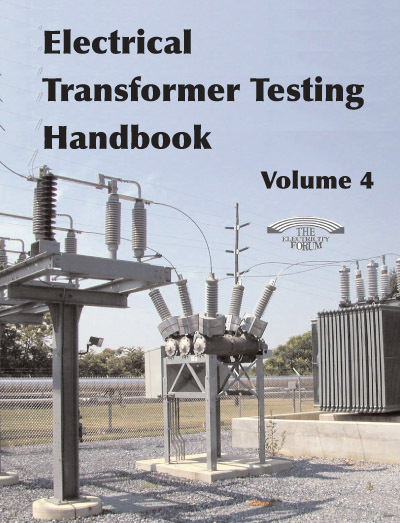 These guidelines are based on insurance industry recommended practices for the location of one of these transformers outdoors. The building owner and/or tenants fire insurance carrier or local inspection authority may restrict the proximity of the equipment to any part of a building structure. It is the Customer’s responsibility to determine the acceptability of the proposed location to those authorities outside of the Company.